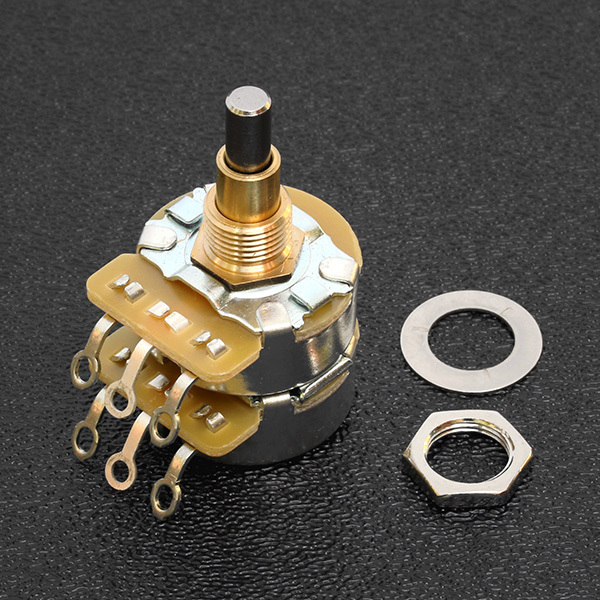 Genuine Fender® (CTS) 500K/250K concentric solid shaft audio taper volume / tone potentiometer. Accepts set-screw mount concentric control knob set, will not work with push-on style knobs. Includes flat dress washer and securing hex nut. 1.7" overall length of entire unit. 0.187" inner rotating solid shaft diameter. 0.320" inner rotating solid shaft length. 0.265" secondary/outer rotating shaft diameter. 0.560" overall length of both rotating shaft(s) above threaded bushing. Inner rotating shaft operates the 250K portion which is the bottom pot as illustrated to the right. Outer or secondary rotating shaft operates the 500K portion which is the upper pot as illustrated to the right.